In this day and age kids are obsessed with their electronics. Their phones are always with them or at least a tablet. I went to visit my granddaughter and we decided not to use any WIFI while I was there. I was so excited to sit down with her and play with the Linkt Athena Necklace Kit (by Continuum Games). Imagine that! Kids working with their hands instead of staring off into a screen. When my granddaughter saw the necklace kit, she actually freaked out and began dancing around. Of course, she is a little girl and it’s jewelry, so yeah. This is something kids crave. They want us to get down to their level and spend quality time with them. We had so much fun simply making a necklace. She will remember this for a very long time and don’t we all just want to make memories? 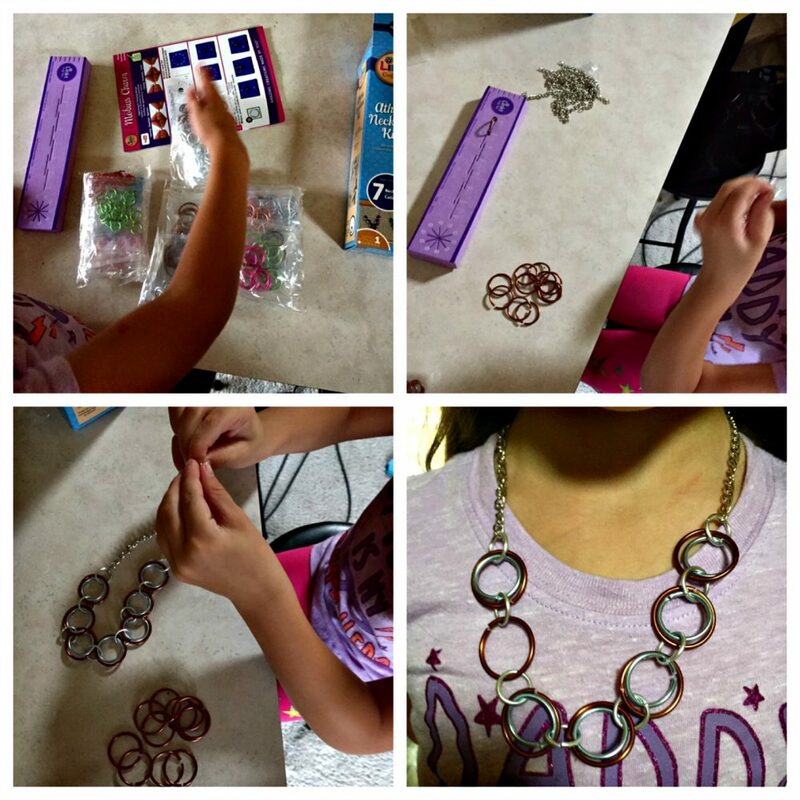 This colorful, amazingly easy kit comes with enough materials for 7 necklaces. Yes, I did say 7! We had enough to make one for each other, one for her mommy and more for friends. At first look, I was a little intimidated. However, it’s absolutely made for beginners. The instruction booklet explains everything in detail. It even comes with a small, purple stand to hold the pieces while you connect them. After everything is connected, you simply pull it up and Violá, it’s done! Literally, a piece of cake. Ok, maybe not “literally”. When I say it’s easy, I’m not kidding. Each bag of different sized hoops has their own letter. You can imagine how easy that gets in the instructions. It’s kind of like “connect a to letter c…”. Easy, right? Continuum Games has other “back to basics” ideas too! They offer over 100 board games for “bored” kids. These games aren’t your Grandparents old boring games either. They have strategies, dice, puzzle games and more. Things like Play Nine, Word Q, Diggin’ Dino Bones, and more. Any child would love to have any of these for the holidays! Previous Post: « The Noodley has Colorful, Light-up Gloves!